MAGICK RIVER: ANWAR WINS BIG!!! 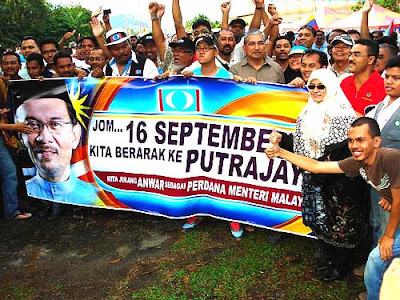 Word from the ground has it that Anwar Ibrahim has already won the Permatang Pauh by-election as at 1:55PM. We shall have to wait till all the votes are counted and the results announced to find out by what majority. No matter what the margin of victory, Anwar is already the MP for PP (People's Power) and automatically becomes the Opposition Leader - an important step towards Putrajaya! My heartfelt congratulations to all who worked so hard to bring about this joyous moment in Malaysia's history. Stop counting chickens mate. We've only just got eggs!!! I also hope for an Anwar high majority win. I share your anxiety. Are you trying to increase traffic for your blog?! Pathetic move! BUMNO & Partners will continue playing their evil tricks. We, rakyat should prepare to stand up anytime from now. Antares - this is a day to celebrate ! A new chapter for a new Malaysia where all our sons and daughters of this country will be treated fairly, justly without fear or favour. Thanks for all your comments, folks. "Are you trying to increase traffic for your blog?! Pathetic move!" What's the matter with you, bub? 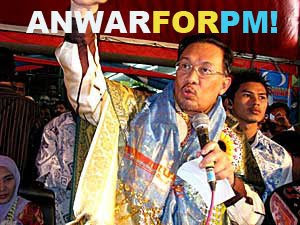 You might as well say Anwar was going around making so many ceramahs just to garner more votes! What's so"pathetic" about winning an important by-e;ection - or increasing traffic to your blog? Sour grapes or what? You must be related to that MCA idiot what's his name, the deputy health minister Liow Ding Dong. Gimme a five! Yay! You got some sore losers here. Hehehe. Now, what's next? I hope it is Parliament before Merdeka. How'z those chickens, mate? Now go ahead, count em... Oops, they're already done!! !